Book 2 or more movie tickets using code BMS125 on BookMyShow till 30thApril, 2017 and get up to Rs.125 off, or 50% off on transaction value, whichever is lower. Go through the regular ticketing flow for selecting the movie, cinema and show of your choice Proceed to payments pageConfirm your details by providing your email id & mobile number as this information will be used for confirming your transactionTo avail offer, click on 'Avail Discounts & Offers & enter BMS125 in the promo code box. Click on “Apply”, and the discount amount will get applied.Complete your payment and you are through! 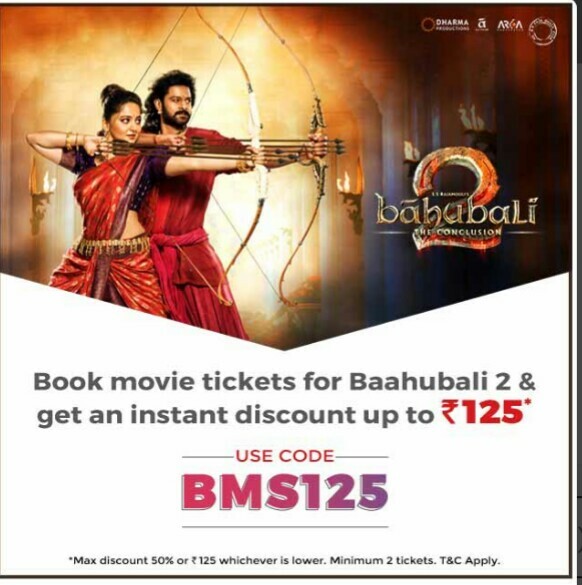 The offer is valid till 30th April, 2017 23:59 hours.A minimum of 2 movie tickets needs to be purchased in order to avail the discount on movie tickets.The offer can be availed once per user during the offer period.The discount Code is valid only on movie transactions and can be redeemed on BookMyShow mobile app and website. Please update your mobile app and avail the offer.The discount is applicable only on ticket price. It excludes all fees and taxes.BookMyShow reserves the right to withdraw or modify this offer at any time without prior notice. In case of any dispute, the decision of BookMyShow will be final.This offer cannot be combined with any other offers/discounts/promotions on BookMyShow.Offer valid only to users who have received direct communication from BookMyShow.Offer valid in select cities only.